Whatever you do, don't teleport out of here before standing on the teleport pad on your right or you'll never get back again. Go forwards and then left, past the updraft and over the small break. Go south to where you'll see Stranger teleport off again. Jump to the right and pick up the Piston for Pump that's lying there before jumping to the Dimension Portal on the ship. Wander north a little and kill the Long Legs gathered around the bunny Teresa. She won't be free just yet though as there's one still on the roof (unless you can coax it down that is). Move on left and kill the Long Legs and Knight beneath another rabbit. Turn around again and use the updraft. Go left to meet a new enemy, a Brain. To kill it just use a Chi attack and then smack it repeatedly whilst it's down and repeat until it's dead. You've freed the first of the four; Lucia. Turn around again and go to the right. Kill the Long Legs, Knight and the Brain on the roof to free Bianca. Then kill the Long Legs on the roof to free Teresa. Go to the right, kill the Long Legs and Knights to free Bruno, the last of the rabbits. Transfer back into the real world and talk to Lucia over by the stream. Empty the field of chickens like Lucia asked and smash the boulders in the way of the drainage ditch. Talk to Bruno and he'll give you a Relic. Talk to Lucia and she'll give you a Dragon Egg. One more task before leaving though, go down to the place where the airship brought you and go to the right on the pier. You'll see Teresa standing out on a tall platform. Use your Move Spell on the platform to rescue her, with that done you can safely head off to Moleville north of Lost Fleet. The exit is up at the end of the drainage ditch. The Professor will talk to you as you enter the area and implore your help in Moleville. First you'll probably want to purchase an Ice Cream from Merton to go back and finish the last fairy quest as well as a new wallet if yours is full, though go for the Ice Cream first and come back later for the wallet as you can't afford both at the same time. Once you've talked to Trina and gotten your XP reward, head back here and go into Moleville via the large mound in the top righthand corner of the wilderness north of Lost Fleet. Kill the Moth and transfer into the Shadow Realm straight away. Go past the barrier and into the main part of Moleville. Activate the teleport pad down there and you'll see Blink up above. Clear the floor of the Longs Legs and Knights all over the place and switch to the real world using the portal on the right. Use the now active updraft in the north to get to a dimension portal to switch back to the Shadow Realm again. Go free Blink. Drop down and go to the left (not up the stairs) where you'll find a Knight. Kill him and then take the Magic Detector Grip from the chest that appears afterwards. Go back out and jump down south over some water and onto a small island. Jump again to get to another Knight and a Magic Detector Transducer when you beat him. Jump back to the main part and go down the bottom right-hand path. Kill the two Periscopes using a Chi attack and then kill the four Knights still guarding Willard. And again back out to the central area and go to the north path destroying the boulder blocking it to get by. Kill the Long Legs and four Knights guarding Sis to set her free. That's the last of the moles so go back to the real world again. Give Sis both of the pieces of the Magic Detector that you've collected. Go through to where Sis was being held and pick up the Digging Gloves there. Go talk to Willard afterwards. Give him those sunglasses you've been holding for most of the game. And now go down to where Blink went. Bianca will tell you to use your Shock spell on him, you should do what she says. Hit him twice to defeat him. It's time to learn about the Sorcerer (or Sorceror, they can't quite decide). Red will now also teach you a new spell, Banish. You'll be given the final relic now. Now is also a nice time to go finish off the last two remaining quests other than to defeat the Sorcerer. Take the Digging Gloves back to Pablo and Fransisco in Cliff Town and if you've got over 30 Dragon Eggs go and talk to Kaitlin in the Dragon Village to earn the Secret Spell which transforms you into an egg. Once you think you're ready, teleport to the Sorcerer's Land. You'll meet Stranger who'll teleport off after the conversation. Kill the Long Legs and Shellys and you'll be able to move on to the next part of the island as a barrier blocking a stepped platform will vanish. In this next area you'll find a load of Knights. Kill them all to progress up to the left. Up here you'll find a couple of trios consisting of two Knights and a Brain. Concentrate your attacks on the Brain primarily as that can do the most damage, the Knights will probably end up dead as a result of attacks on the Brain anyway. Once both parties are dead move on right where you'll meet up with Stranger again. It's time to decide between saving the world and becoming the most powerful dragon ever. Either choice will do though as there's no story splitting in this game you'll be forced to be good. When you're finally ready to fight the Sorcerer once and for all, put your five remaining Relics in the door and enter. 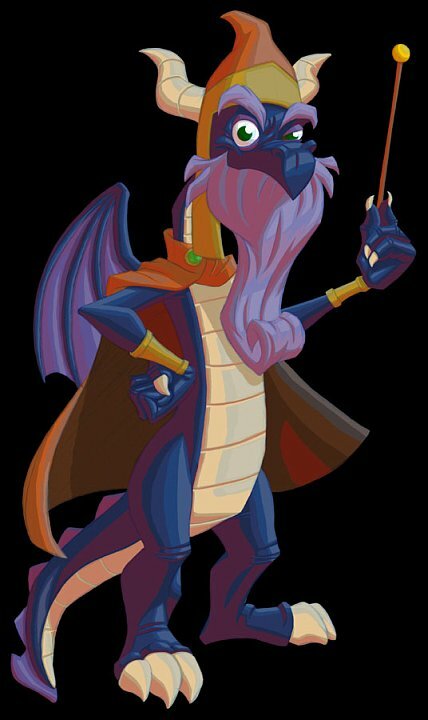 The Sorcerer will reveal himself to be a huge purple and red dragon. Get ready for the fight. He'll cast a spell that sends a ball of energy at you. It's slow enough for you to cast Banish on it and send it back to him (make sure to cast it on the spell rather than him). Once you cast Banish cast Move and use it to raise the platform in the centre of the room. Use that platform to leap over to the Sorcerer and kick him whilst he's down. He'll start to get back up again so race back to where you were before and get ready for the next part. He'll send another energy ball at you, reflect it using Banish and then he'll send another, reflect it again and use move to raise the platform again. Glide over to him and attack with your horns repeatedly. Repeat again but this time with three banishes before going over to him and hitting him. This is the final time, Sorcerer defeated. There's nothing more to do in the game now, you can level up to 25 and get any spells you haven't yet earned but there's no more story I'm afraid. Can anyone tell me.. do I have to be standing on the teleport pad on my way back or do I just need to make it light up????? Please help me!!! Before I have to restart the game AGAIN!! When you finish this game head at least north-east of the Dojo and you will see walking around. You also see walking around south of the Dojo and and just walk around the Dogo. I didn't really like that bosses all that much. I dunno... too simple. Yay! I just beat the game!!! Fighting the Sorceror was fun. Is there a glitch in the game cuz when I try to get teresa down there's no red x when i cast the move spell. Also, the shop by the moles is closed "due to an emergency at moneybags residence" ??? I need help getting teresa down, I dont get it. PLEASE HELP ME!!!!!!!!!!! I just beat this game. Either try and increase your general magic level or try and teleport from a location closer to the Forgotten Worlds. If however you didn't step on the teleport platform there then unfortunately there's no way to get back.